Raised a Catholic by his mother, Alex Gibbs renounced his faith and stopped going to church at Temple University. 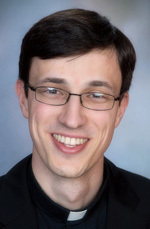 “So that was my, you know, grand rebellion,” said now Father Alex Gibbs, who was ordained a priest for the Philadelphia Archdiocese May 16. At Temple he took a general education course. The professor was a St. Augustine scholar, and one day in class he discussed the difference between right and wrong with his class. Gibbs smugly dismissed any separation between the two. The professor challenged Gibbs, and the argument became heated. The teacher’s rebuke caused a change in Gibbs. By the end of his first year at Temple, Father Gibbs said he had “a real moment of grace, a moment of conversion” while reading St. Augustine’s “Confessions.” He received the gift of faith and returned to the church. “I just very powerfully experienced God,” Father Gibbs said. He started participating in Mass and the sacrament of reconciliation at the Temple Newman Center. “Eventually I figured you’re supposed to pray, like, daily, so I said an Our Father every day,” he said. Slowly, he communicated more with God as time went on. In the middle of sophomore year, he began thinking about his vocation. He initially thought about being a monk and attended a retreat during college in New York with friends, including Jozef Jozefowski. Jozefowski said people knew Gibbs for initiating and keeping contact. He still communicates with friends from college. Jozefowski met Gibbs on Temple’s campus and the two struck up a conversation and remained friends since. Jozefowski described his friend as outgoing and adventurous. While a Temple student, Gibbs attended an overnight retreat at St. Charles Borromeo Seminary and thought about the priesthood from then forward. Part of the retreat was witnessing an ordination firsthand, and for Gibbs it was very influential. By the end of his time at Temple, he liked different religious orders but didn’t feel called to them. Around this time, he saw Pope Benedict XVI celebrate Mass at Yankee Stadium during his visit to New York City in 2008. The pope told young people to pursue vocations to the priesthood and religious life. Pope Benedict didn’t say anything further. That hit home for Gibbs during his junior year at Temple, where he felt a good sense of community at the Newman Center. That propelled Gibbs to apply to the seminary. He entered but had some doubts along the way. Now he is certain of his vocation. Father Gibbs wants to be a spiritual presence for people, to change lives, and he looks to the sacrament of reconciliation as a moment for that to happen.